Urmston /ˈɜːrmstən/ ( listen) is a town in Trafford, Greater Manchester, England, which had a population of 41,825 at the 2011 Census. Historically in Lancashire, it is about six miles (10 km) southwest of Manchester city centre. The southern boundary is the River Mersey, with Stretford lying to the east and Flixton to the west. Davyhulme lies to the north of the town centre. Urmston covers an area of 4,799 acres (19 km²). The town has early medieval origins, and until the arrival of the railway in 1873 was a small farming community. The railway acted as a catalyst, transforming the town into a residence for the middle classes. Today, Urmston is one of the major urban areas in Trafford as it includes the areas of Davyhulme and Flixton. In 1983, during an excavation by South Trafford Archaeological Group, fragments of Roman pottery were found in the area now occupied by the cemetery – previously the site of Urmston Old Hall – suggesting that there may have been a Roman settlement on the site. In the early 13th century, Lord Greenhalgh and his family lived at Highfield House (under what is now the M60 motorway). Shortly after the Norman conquest of England, between 1069 and 1070, William the Conqueror led a military campaign against the Saxon Earl Edwin, who ruled England north of the River Mersey. On the campaign's successful conclusion, William gave his kinsman Roger de Poictou all of the land between the River Mersey and the River Ribble. Part of this land was in turn given to Albert de Greslet, who towards the end of the 12th century, bestowed as much land as a team of oxen could plough in one-year on Orme Fitz Seward, the son of Edward Aylward. It is probable that the name Urmston is derived from Orme's Easton, or Ormestun, the "tun" or dwelling of Orme Fitz Seward. The Manor of Urmston was rented by a family using the local surname. The earliest known member of the Urmston family is Richard de Urmston, who was recorded in 1193–94 as giving 40 shillings "for having the king's good will". Orme Fitz Seward's land passed to Richard de Trafford in the 13th century. The de Trafford family later lost the land, but won it back as the result of a duel. Urmston Old Hall was the home of the manorial lord, and a centre of power in the area during the Middle Ages. The Old Hall was completely rebuilt in brick and timber in the late 16th century. New Croft Hall, also in Urmston, was the residence of a wealthy freeman and may have been moated. Urmston was only one of three manors in Trafford to have had two medieval halls, the others being Hale and Timperley. Neither of the halls has survived to the present day. Farming was the main occupation in Urmston until the early 19th century, when weaving became a significant source of employment, although this later declined due to competition from large industry. In 1848, the population was recorded as being 771, with around 80% of the land being farmed. The opening of the Cheshire Lines Railway in 1873 allowed the town to grow as a commuter town: between 1871 and 1901 the population grew by over 650%, from 996 to 6,594. By 1901, farming had virtually died out, and the town became a residence for the middle classes. In 1948 the Minister for Health, Aneurin Bevan, conducted the symbolic inauguration of the National Health Service at Davyhulme's Park Hospital, now renamed Trafford General Hospital. The area was home to the first District heating system in England. In operation by 1948, a boiler house supplied hot water to 200 homes on a newly built housing estate. The water was heated with low-grade fuels such as peat and coke, with houses built in groups of four for better efficiency. Coat of Arms of the former Urmston Urban District Council. Once a township in the parish of Flixton, Urmston became an urban district of the administrative county of Lancashire, under the Local Government Act 1894. The Local Government Act 1972 abolished the Urban District of Urmston and in 1974 Urmston became a district of the Metropolitan Borough of Trafford, in the metropolitan county of Greater Manchester. The parliamentary constituency of Stretford and Urmston was formed in 1997. Kate Green, a member of the Labour Party, became the MP at the 2010 General Election, with a majority of 8,935, representing 48.6% of the vote. The Conservatives took 28.7% of the vote, the Liberal Democrats 16.9%, the United Kingdom Independence Party 3.4%, the Green Party 2.0%, and the Christian Party 0.4%. Urmston is one of the four major urban areas in Trafford, the other three being Altrincham, Sale and Stretford. In local elections for Trafford Council, Urmston is split into four wards: Davyhulme East, Davyhulme West, Flixton and Urmston. Like every other ward in Trafford they are each represented by three local councillors, giving Urmston 12 of the 63 seats on Trafford Council; as of the 2012 local election nine of these were held by the Conservative Party, and three by Labour. The wards elect in thirds on a four yearly cycle. Metropolitan Borough of Trafford, highlighting Urmston in red. Urmston occupies an area of 7.5 square miles (19.4 km2), at 53°26′55″N 2°22′29″W﻿ / ﻿53.44861°N 2.37472°W﻿ / 53.44861; -2.37472 (53.4487, −2.3747); it is approximately 137 feet (42 m) above sea level at its highest point. The land is relatively flat, sloping gently from north to south. Urmston's climate is generally temperate, with few extremes of temperature or weather. The mean temperature is slightly above average for the United Kingdom. Annual rainfall and average amount of sunshine are both slightly below the average for the UK. Urmston comprises the areas of Davyhulme, Dumplington, Flixton and Urmston, with the River Mersey forming the southern boundary. For administrative reasons, Partington is sometimes considered to be part of Urmston. The most southerly part of Urmston lies within the flood plain of the River Mersey, an area known as Urmston Meadows, part of the Mersey Valley. Much work was carried out in the 1970s to canalise the Mersey, in an effort to speed up the flow of floodwater and thus reduce the risk of flooding. Upstream emergency floodbasins such as Sale Water Park, lying just to the east of Urmston, have also been constructed. The M60 Manchester orbital motorway passes through the northern half of Urmston, from southeast to northwest, and the M62 motorway lies just to the west. The Thirlmere Aqueduct also passes through the Urmston area. As of the 2001 UK census, Urmston had a population of 40,964. The population density was 10,881 inhabitants per square mile (4,201/km2), and for every 100 females, there were 93.0 males. Of the 19,172 households in Urmston, 39.9% were married couples living together, 29.6% were one-person households, 7.7% were co-habiting couples and 8.9% were lone parents. Of those aged 16–74 in Urmston, 25.5% had no academic qualifications, slightly high compared to 21.3% for all of Trafford but slightly lower than the 28.9% in England. The ASK development in Urmston, viewed from the new precinct. New apartments are under construction. The Trafford Centre, a large shopping and leisure complex, is at Dumplington, north of Urmston. Some locals felt that it brought about the decline of Urmston Precinct, the town's central shopping area – dating back to the 1960s – where many units closed or became "pound shops". Beginning in 2007, Urmston Precinct was demolished and a £45 million redevelopment of the site got underway, to include 140,000 square feet (13,006 m2) of retail and leisure space and 144 apartments. This redevelopment project is now known as Eden Square. A new Sainsbury's opened in the summer of 2009 as did the relocated local library with the rest of the new shopping precinct expected to follow later in the year. This was followed by the opening of an Aldi supermarket; a few budget stores; bars; and cafes. The average price for a semi-detached home in Urmston is £155,475, whilst a detached house will cost on average £247,630. Semi-detached prices have more than doubled from an average of £60,000 in 1998, although house prices in most areas of the country have seen a similar increase. These figures are, however, below the England and Wales average. As of the 2001 UK census, Urmston had a possible workforce of approximately 32,996 people. The economic activity of residents in Urmston was 46.1% in full-time employment, 12.6% in part-time employment, 6.9% self-employed, 2.1% unemployed, 2.5% students with jobs, 3.0% students without jobs, 14.7% retired, 4.5% looking after home or family, 5.4% permanently sick or disabled and 2.2% economically inactive for other reasons. Urmston has a low rate of unemployment (2.1%) compared with Trafford (2.7%) and England (3.3%). The Office for National Statistics estimated that during the period of April 2001 to March 2002 the average gross weekly income of households in Urmston was £504 (£26,209 per year). According to the 2001 UK census, the industry of employment of residents in Urmston was 17.1% retail and wholesale, 14.0% health and social work, 13.9% manufacturing, 13.4% property and business services, 8.1% transport and communications, 7.2% education, 6.8% construction, 5.3% finance, 4.9% public administration and defence, 3.4% hotels and restaurants, 0.9% energy and water supply, 0.4% agriculture, 0.1% in mining, and 4.3% other. This was roughly in line with national figures. Urmston Musical Theatre was formed as the Urmston and District Operatic Society in 1911. Its current president is actor Matthew Kelly, who was born in Urmston. It performs an adult main show in October with rehearsals running from June to October and a pantomime in January/February with rehearsals running from November to the date of the show. Both shows are performed at the Poolside Theatre within the Urmston Leisure Centre. Its youth section performs a show in May at St Antony's Catholic College in Urmston. Canterbury Players is a local amateur dramatic society. Performances are given on stage at the Davyhulme (Wesley) Methodist Church located in Brook Road, Flixton. In the mid-20th century there were 20 cinemas in Trafford, of which the only survivor is the New Curzon, in Princess Road. It opened in 1931 as the Curzon. It was converted to a twin cinema and bingo club in the 1970s, and re-opened under its present name of the New Curzon in 1980, after a £100,000 conversion. Since 2003, the building has been shared with Flixton Dance Studio. Recently, due to financial reasons, the New Curzon has been forced to close down. St Clements Church on Manor Avenue, as well as being a place of worship, is also a venue for concerts and other events and is often used by local musical bands, amateur and semi-professional; local societies, and local schools for their concerts and special events. In 1963 the council booked the Beatles to play at the Urmston Show at Abbotsfield Park in Chassen Road on Monday 5 August. At the time of the booking, they were not well known, but had risen in popularity by the time of their appearance. David Hamilton who was the compere, for which he received ten guineas (£10.50), commented: "The boys were smuggled in in a van ... screaming girls rushed the stage, trying to get hold of their idols ... it was certainly a hard day's night." Urmston Cricket Club was founded in 1846 as Urmston & Flixton Cricket Club. As well as serving as a social club, it expanded to include other sports including hockey, tennis, and bowls. The club has been located on Moorside Road since 1870. Urmston Riding Club was established in 1956 on Southgate on the Urmston–Flixton border, and has approximately 150 members. AFC Urmston provides football coaching facilities, and has teams ranging from under 7s to under 17s. The club was founded in 1977, as Meadowside Athletic FC, and has won the Manchester County FA Youth Cup. Lostock Road, which connects Davyhulme Circle to Barton Road, was from 1936–37 widened to include two protected cycle tracks. The scheme, designed by borough surveyor Ernest Leeming and intended to improve transport connections between the neighbouring towns, was completed by October 1937. Junctions 9 and 10 of the M60 orbital motorway connect Urmston to the rest of Greater Manchester and the motorway network. A junction previously existed further east along the motorway under its old M63 designation, but was closed on the opening of the A6144(M) in 1987. A well known local landmark, opened in 1960, is the Barton High level motorway bridge, which crosses the Manchester Ship Canal. Urmston is connected to Liverpool and Manchester by the Cheshire Lines Committee railway line which passes through Warrington and Liverpool South Parkway (for Liverpool John Lennon Airport). There are three railway stations in the Urmston area (Urmston station in Urmston town centre, Chassen Road and Flixton stations in neighbouring Flixton). Trains stopping at these stations are operated by Northern. Urmston is not served by Metrolink. The nearest Metrolink stations are in Stretford and Eccles. Along with the rest of Trafford, Urmston maintains a selective education system assessed by the 11-plus examination. There are four primary, infant or junior schools in Urmston, including Urmston Primary School, together with an independent prep school, Abbotsford Preparatory School, in addition to four secondary schools, Urmston Grammar School and St Antony's Catholic College, Wellacre and Flixton Girls School. Urmston Grammar School is a specialist science and language college; the school was assessed as "outstanding" in its February 2006 Ofsted report. St Antony's Catholic College is a specialist Business and Enterprise College. In its October 2005 Ofsted report the school was assessed as "a good and improving school with some outstanding features". As of the 2001 UK census, 82.3% of Urmston's residents reported themselves as being Christian, 0.8% Muslim, 0.2% Hindu, 0.1% Jewish, 0.1% Buddhist and 0.1% Sikh. The census recorded 10.5% as having no religion, 0.1% had an alternative religion and 6.6% did not state their religion. 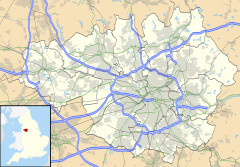 Urmston is in the Catholic Diocese of Salford, and the Church of England Diocese of Manchester. There are three listed churches in Urmston: the Church of St Clement (Grade II), the Church of St Michael's (Grade II*), and the Church of All Saints (Grade I). The Church of All Saints was built in 1867–68 by E. W. Pugin, in the Gothic Revival style; the church is said to be a "notably complete and unspoiled" example of Pugin's best work. St Clement's Church was built in 1868 by J Medland Taylor, also in the Gothic Revival style. The Church of St Michael was first mentioned in 1189–91 although may be even older. It was rebuilt in 1815, 1824, and 1888. There are two listed structures in the grounds of the church, the sundial and the Jones Chest tomb. The Church of St Michael is one of 11 Grade II* listed buildings in Trafford, and All Saints is one of six Grade I listed buildings in Trafford. Suzanne Charlton, BBC weather presenter and daughter of Bobby Charlton, was born in Urmston, as was Judy Loe, actress mother of Kate Beckinsale and wife of the late Richard Beckinsale. Other people born in the town include actor and entertainer Matthew Kelly, two former Manchester City footballers, David White and Michael Johnson, Franklin Charles Buckley (more commonly known as Major Frank Buckley) an English football player and notable manager for both Blackpool and Wolverhampton Wanderers, Lynda Baron, best known for playing Nurse Gladys Emmanuel in Open All Hours, and Jeremy "Jez" Kerr, singer and bassist of post-punk band A Certain Ratio. Actor George Coulouris was partly brought up in Urmston. Keith Hopwood, the rhythm guitarist of Herman's Hermits, attended Urmston Grammar School. Former Manchester United player David Herd had a home in Urmston; Herd had owned a local garage that still bears his name. Debbie Moore, founder of Pineapple Dance Studios was born in the area and Danielle Hope, the winner of BBC TV's Over the Rainbow, was also a resident. The 18th-century caricaturist and satirical poet John Collier, who used the pseudonym Tim Bobbins, was born in Urmston in 1708. A self-styled Lancashire Hogarth, his first and most famous work, A View of the Lancashire Dialect, or, Tummus and Mary, appeared in 1746, the earliest significant piece of published Lancashire dialect. A local public house, The Tim Bobbin, is named after him. Steven Patrick Morrissey, former lead singer of The Smiths, was born here in 1959. ^ "Town population 2011". Retrieved 9 January 2015. ^ Nevell (1997), p. 17, 20. ^ Nevell (1997), p. 49, 74. ^ Nevell (1997), p. 62, 86–87, 100. ^ "Eden Square Shopping Complex: Urmston". www.edensquare-shopping.co.uk. Retrieved 13 April 2016. ^ "Shopping | Eden Square Shopping Complex, Urmston". www.edensquare-shopping.co.uk. Retrieved 13 April 2016. ^ Rendell, Cinemas of Trafford, p. 67. ^ a b Harry (2000), pp. 5–6. ^ Nevell (1997), p. 29, 106. ^ "Danielle Hope wins Over the Rainbow". The Telegraph. London: Telegraph Media Group. 22 May 2010. Retrieved 28 May 2010. Wikimedia Commons has media related to Urmston.